Your group will be located in Cuyutlan on the Pacific Coast where you will spend your time learning Spanish and helping out on a variety of conservation projects. This could be helping to identify turtle nesting sites and relocating the eggs until they hatch, studying crocodiles and maintaining their pens, feeding and caring for iguanas or conducting biodiversity studies. 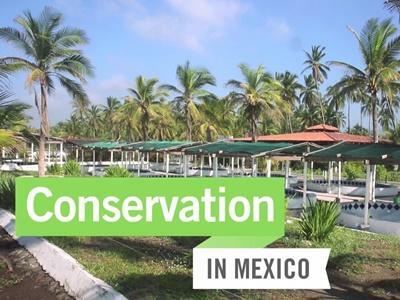 Our Conservation project in Mexico offers your group the chance to work alongside local experts at a variety of locations, all with the common goal of conserving important environments and protecting endangered species. This is a great project for any groups that are interested in Biology, Science and conservation work, especially considering that there is a lot of hands-on work and opportunities to learn about the fascinating wildlife. What is my role on this project? Turtle conservation: Located next to the lagoon where the biodiversity studies are conducted, the El Tortugario Centro Ecológico de Cuyutlan is where our turtle conservation project is based. Using the 24 km stretch of coastline, the group will take part in night patrols to identify new turtle nests, collect sea turtle eggs in order to relocate them to a safe place, and keep an eye out for poaching activity. Groups will also collect information about the in situ or poached nests for research and statistical purposes. 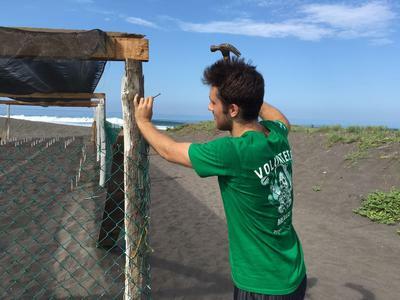 Volunteers will monitor the nests where the relocated eggs have been placed, and once the baby turtles have hatched, help clean the nests and release the hatchlings into the sea. 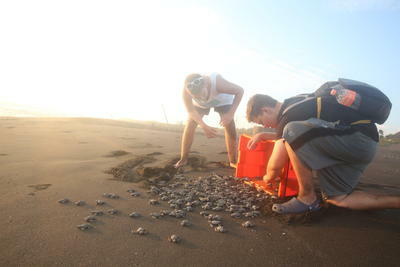 Other activities include cleaning out the hatchling tanks and caring for the adult turtles making sure that they are clean, well fed, unstressed, uninjured and measured and weighed once a month. Assisting at a crocodile park: The group will visit La Colorada Crocodile Center in Cofradia de Morelos once a week, and help with clean and maintain the pens, as well as help maintain the centre’s facilities. You will also be involved in taking biometric data and marking the crocodiles in nearby lagoons. Caring for iguanas: Individuals from the group will help to feed baby and adult green iguanas, and maintain their enclosures. Biodiversity studies: The group will also be required to monitor the presence and condition of wildlife in the Palo Verde estuary and El Chupadero lagoon, and maintain a register through direct observation and trap cameras for night surveillance. This includes monitoring and collecting data on the state of nearby mangrove forests, help to grow mangrove seedlings in a greenhouse, and reforest areas where the mangrove forest has been damaged or removed. Educational and environmental outreach: Volunteers will take part in environmental education initiatives by visiting schools and running environmental awareness campaigns in nearby communities. Community beach clean-ups: You will spend some afternoons collecting rubbish and debris from the beaches. Our aims and objectives of this project are focused around the conservation and reintroduction of various species of wildlife, as well as conducting biodiversity studies to assess the health and diversity of these ecosystems. Conservation sites in Mexico are protected by SEMARNAT (The Department of Environmental Affairs and Natural Resources). In recognition of our commitment to conservation we have been entrusted to manage a section of coastline stretching 24km. One of the conditions of our agreement with SEMARNAT is that we undertake significant scientific research on the coastline. We have a wide range of established and new projects which survive thanks to our volunteers. The three main species we work to conserve are Olive Ridley turtles, American crocodiles and Morelet’s crocodiles. Since 2006 we have also been working at a lagoon called "El Chupadero". Following several years of data collection by the volunteers the area was declared a Ramsar site in March 2009. A Ramsar site is awarded by the Ramsar Convention. They recognise wetlands as ecosystems that are extremely important for biodiversity. This is one of the most important titles a protected area can receive. It is testament to the hard work and effort put in by volunteers and staff. You can receive up to four hours of Spanish tuition a day if you wish to include this in the project. Classes are extremely interactive and you will receive great encouragement every step of the way. Whether you want to master the basics or just to brush up, or improve your Spanish, the teaching will be adjusted to your level. 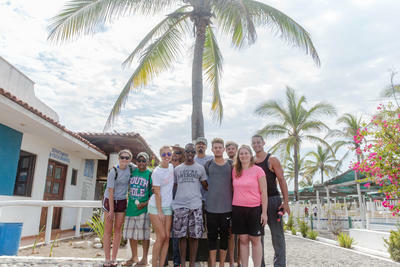 Living in Cuyutlan, your group will be staying in a shared house close to both the beach and the town. The house includes several single and shared bedrooms, as well as a communal kitchen and a pool to enjoy in the evenings or during your time off, though you will be required to help with basic upkeep of the house. The small resort town is just a few kilometres away and the nearby beaches are made up of volcanic black sands. As for the commute to work, the turtle conservation centre is just 1km away and so makes for a nice morning walk each day. Mexico is a real meeting-place of cultures; a modern, industrialised and well-educated country that's full of history. It is also one of the most diverse countries in the world in terms of biodiversity, with over 200,000 different species of flora and fauna.